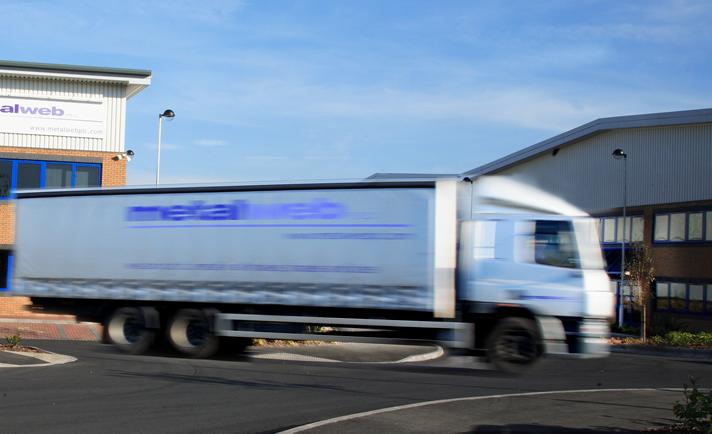 Delivery & Transportation | Metal Web | UK metals stockholder and processor. Delivery to where you need it when you need it. Inside the UK metalweb operate and deliver from each of our five UK sites including our 50,000 sq.ft. operation in Birmingham. Our in-house transport fleet ensures our product reaches you on-time and in prime condition. In the UK we are able to offer a range of delivery options to suit your requirements, including next day delivery when required. In addition, our integrated IT system allows us to advise customers of the date of delivery at the time of sale — so you will know at the time of order when to expect your product. Many of our customers look to us to help them achieve a lean and cost efficient supply chain. Through our ‘just-in-time’ delivery, purchasing operation and in-house first stage processing operations we can provide you with a lower ‘total acquisition cost’. Outside of the UK we supply many export customers located around the world. We support this through third party logistics in a variety of formats including road transport, sea freight and air freight. Please see here for further details on export sales service.